Standing on a hill overlooking the farmlands of Phillipi, Rashiq Fataar got thinking about the importance of field trips and site visits as a key part of the ‘new school’ of learning. 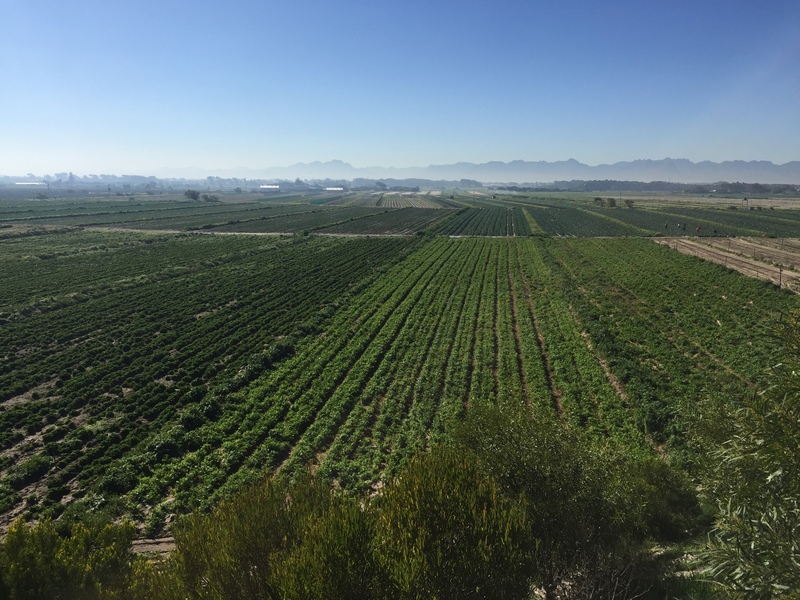 It’s an unseasonably warm and bright winter’s morning during a team field trip to the Philippi Horticultural Area, where we will meet Nazeer Sonday and hear about the progress on a new 4,000 sqm area he is bringing back to life. Carolina, a Masters graduate in Sustainable Design, recently completed her thesis on sustainable urban farming in Bogota and is asking questions about the food systems and politics in the area. Surrounding by some of the brightest minds in academia, I started to think about the many ways all our team is continuing to learn through our work. At Ocean House we took over an entire wall to prepare a moodboard of inspiration for our first Contributor’s brunch (now quarterly). Our Cape Town-based writers have gathered to discuss our theme, ‘The future is inevitable’. An urban planner, an engineer, a lawyer, an architect, a sustainability consultant and others debated the inevitable future of our city and our ideas for change – and the delicious salads from Sababa certainly helped us along. During our Young Urbanists field trips, there was an immense amount of learning about the past and future of the iconic Silos from Mark Coetzee, director of the ZEITZ Museum of Contemporary Art Africa (to open in 2017). On another field trip, we saw a new approach to informal settlement upgrading at the Empower Shack project in Khayelitsha. These vastly different projects have taught us to absorb and appreciate the diverse parts of the city under construction. By the time you read this, most of the website articles for September and even parts of October have already been signed off, bar one or two ideas. There are some great ideas to share, including architecture students thinking about how to expand the National Gallery, Olamide’s thoughts on building on water in Lagos, and Claire unpacking what gentrification (or rather, renewal) might mean in a township context. If you popped by Thornhill Park right now in Green Point, a giant blue mesh wraps the entire fence, sharing the construction deadlines Blok and Future Cape Town hope to achieve, with arborists already on site to trim the large trees. With the fantastic collaboration of Olivia who joined us from Montreal for 2 months (keeping things together while Brett was at school), soon we will also be able to turn your eye to Regent Road’s parking bays, and the Sea Point Promenade, as our public space collaboration with Blok unfolds. For three weeks of August, Brett enjoyed the Amsterdam version of summer, at Europe’s first university course dedicated to cycle planning. He also had time to head to Copenhagen for a day to meet our friends at Copenhagenize for a bike tour of the city’s groundbreaking bicycle culture and infrastructure, as well as a chat about our research collaboration on cyclist behaviour at intersections. With a bit more fundraising and now the support of the City of Cape Town, there will be more updates very soon. Andrea gathered insights at the Innovation Summit and Tech for Africa, both hosted at Cape Town Stadium. Carolina spent a day at the One Extreme Day workshop thinking of ways to improve Cape Town Station and I learnt a bit about land value capture at a seminar at the lovely corner-shop-like DAG Cafe. In the last week of September I will be heading to the first of three workshops of the Urban Innovation Lab, bringing together leaders and activists from as far as Afghanistan and Albania to use design thinking in the area of urban innovation. Christine heads to Johannesburg to explore the future city at the Architecture ZA biennial, poignant since her thesis covered the future of the World Cup stadia. Carolina will likely be in Zurich or Milan, further expanding our placemaking learning with new partners. As we look out towards the end of 2015, we’ll be visiting Barcelona for the Smart City Expo World Congress, and catch a train to the Guggenheim Bilbao, to see a snippet of our website as part of the Making Africa exhibition. And there will be some time in Madrid, one of my favourite cities. And that brings to a close our report on the first two thirds of 2015. If you have new ideas, or want to get involved, or help us find a donated bicycle for our team, feel free to get in touch (hello@futurecapetown.com) or (christine@futurecapetown.com) . Many thanks for coming along this journey of learning with us. So many interesting and amazing projects – so much to learn and so much to do. Thanks for sharing.